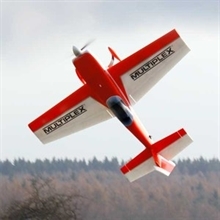 The full-size Extra 300 S is a single-seat aerobatic aircraft with a wingspan of 7.5 m, powered by a Lycoming six-cylinder opposed engine generating 300 BHP. It is a very popular aircraft, widely flown in aerobatic competitions, airshows and air-races. 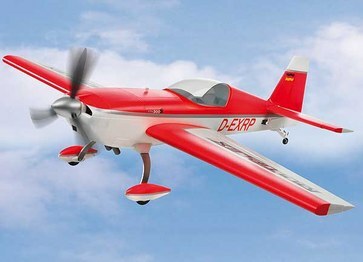 Our ELAPOR® model is of manageable size, and offers a superb aerobatic performance as well as looking great. The machine’s lines are very accurate, and it features numerous details such as dummy rivets and exhausts, a detailed cockpit interior and a scale colour scheme. The Extra 300 S is primarily designed for the classic aerobatic schedule, but also copes very well with 3D flying. Competent pilots will thoroughly enjoy positive and negative snap-rolls, knife-edge flight and flips. The 4S power system provides enormous power and stunning vertical climbing ability. ELAPOR® model, 100% factory-assembled, including PERMAX BL-O 3720-630 motor, MULTIcont BL-50 speed controller, 12 x 8" three-blade propeller, four MS-13020 servos, painted finish with decals applied, comprehensive instructions.